Here's another one from the Rail of Light exhibit during Nuit Blanche. This is the view from the West Toronto Railpath, underneath the Wallace Ave Footbridge. 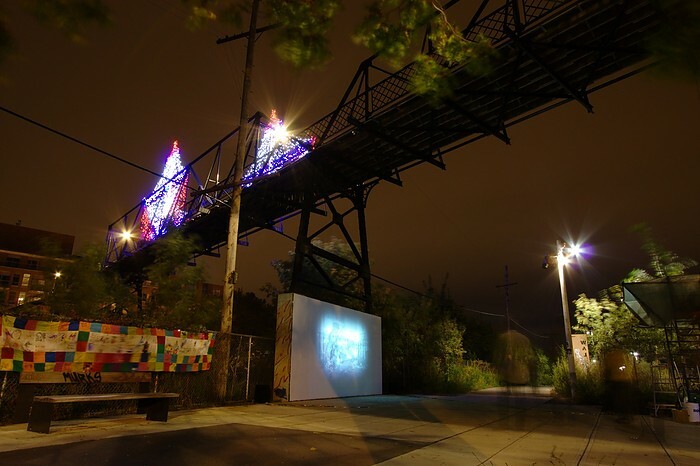 This gives a good overview of the whole project: Richard Mongiat's light installation on the bridge above the tracks, Jeff Winch's video projection underneath the bridge, and even train-related artwork on the fence by some local kids. It was actually pretty busy under this bridge with many people coming through to check it out. But the long shutter speed used for this photo just caught some of the "ghosts" walking by. October 3, 2010. 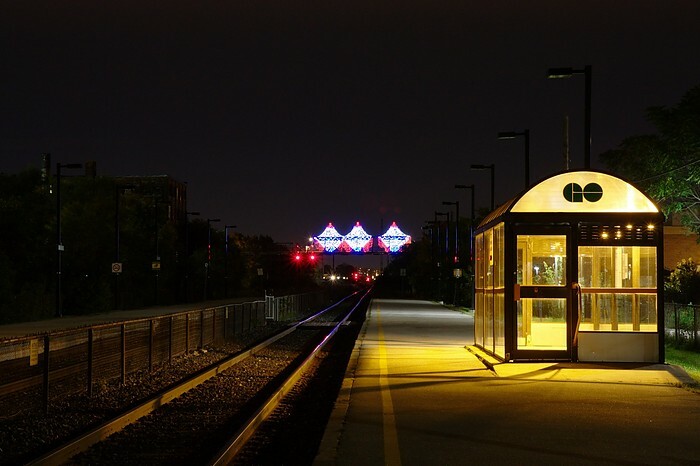 The Rail of Light art installation on the Wallace Ave. footbridge during Nuit Blanche illuminates the railway tracks below, to "shed light" on the railway expansion controversy. This is the view from the GO Transit Bloor Station, just south of the bridge. October 3, 2010. A self-portrait in front of the Rail of Light exhibit, which took place on the Wallace Ave. Footbridge and West Toronto Railpath during Nuit Blanche. I took the photo from the north end of the vacant Glidden Paint site, just north of the bridge. 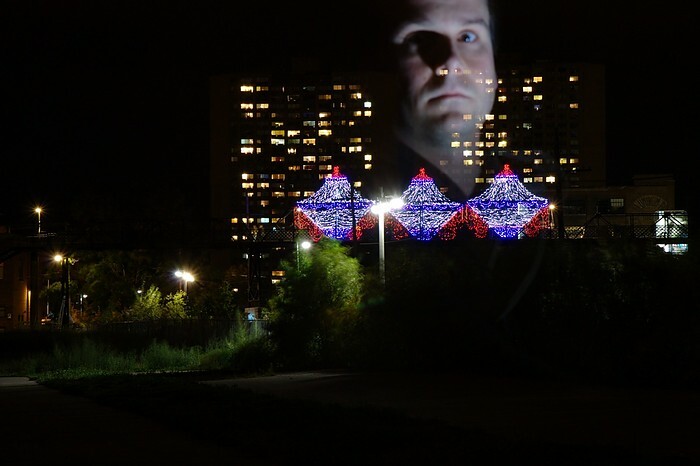 The Rail of Light installation aimed to "shed light" on the controversial railway expansion project happening below. I will post some non-goofy photos next. It was fun taking pics here at night. September 22, 2010. 6:47PM. This was the final sunset that the Tower Automotive chimney would see. It was half-demolished, and the job was finished the following day. This is the view from the northernmost end of the Tower Automotive property on Perth Ave, right next to the Church of the Firstborn (this area is currently being used as some kind of wood-chipping lot). The homes on this southernmost stretch of Perth Ave. now have a very different streetscape surrounding them. 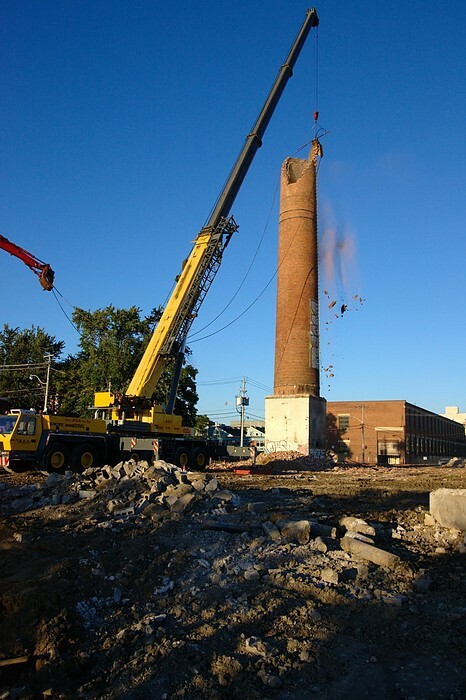 The rest of my photos from the September 22 chimney demolition are here. September 22, 2010. 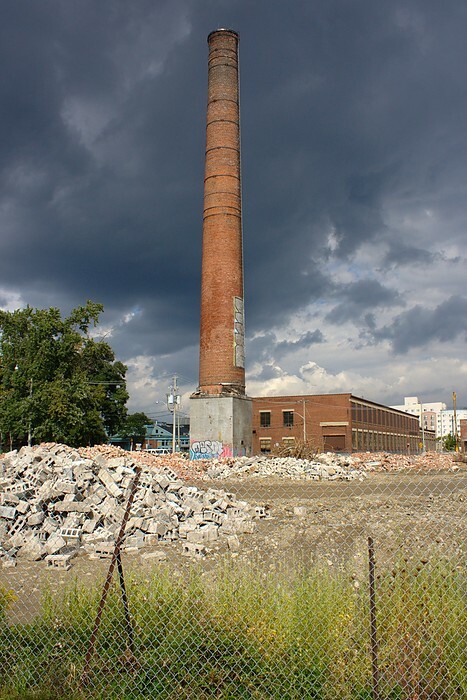 This was the day that the demolition of the Tower Automotive chimney on Sterling Rd. finally began. I dropped by the site for a final look on my way to work, and saw them move some of the equipment in. I couldn't stick around for very long though, so I didn't get to see very much of the demo. I went by again on my way home from work and the chimney was only half-gone, and still being slowly chipped away by the demolition machines. Small crowds of people were stopped on the Railpath and Perth Ave. to watch as this thing slowly come down. Some people were disappointed that it wasn't taken down in one big blast of dynamite. That would have been cool to watch, but it's way too close to peoples' homes. They actually halted the demolition at around 6:30pm, shortly after I took this photo, and then finished the job the following day. September 21, 2010. 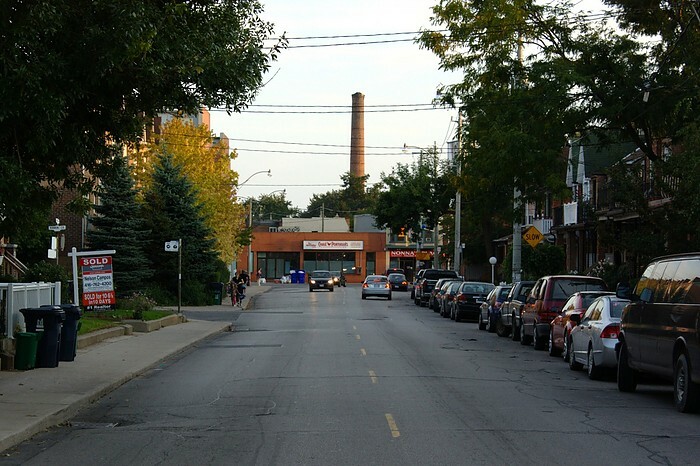 Looking south on Symington Ave. towards Bloor St. This was the final evening before the demolition of the Tower Automotive chimney on Sterling Rd. began. I've always liked that the view down my street terminated with this scene. A block east on Campbell Ave., the view still terminates with the remaining Tower Automotive skyscraper. It's also too bad that the Portuguese chicken place at Bloor and Symington has been closed since before we moved here. I have to hike up to Dupont St. or Lansdowne Ave. for my fix. 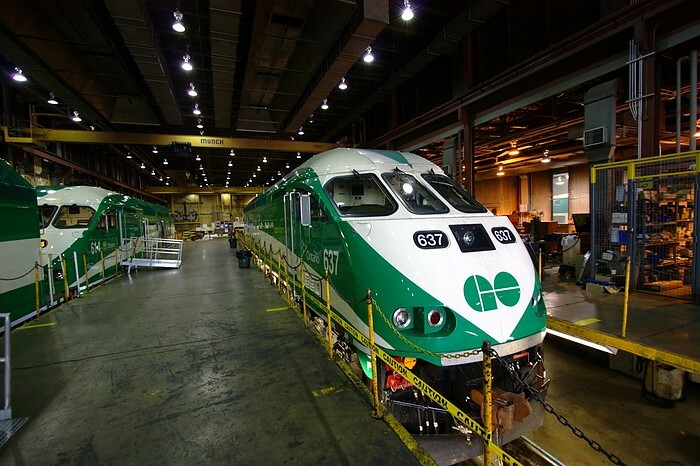 September 18, 2010 was the GO Transit / Metrolinx Family Day, which was held this year at their Willowbrook train yard. I was pretty excited to go, much like a little kid at a toy store, and was really looking forward to exploring this place and seeing the trains up-close. We arrived kind of late, and ended up spending a big chunk of time taking a train through the "train wash", which is basically like an enormous car wash. Sounds cooler than it really was, as we didn't really see anything because it was so dark. After the train wash, my time to tour the facility was very limited, so I didn't get many pictures. But the staff at the repair facility were super-cool and gave me a short personal tour and a look inside a couple of the locomotives. All-in-all, a very fun time, but I wish I spent more time touring. More photos from that day, though nothing spectacular, are here. September 12, 2010. Jen and I went for a walk around the 'hood, and took some shortcuts through the Ritchie - Herman - Gold - Silver area just south of the Dundas and Bloor intersection. 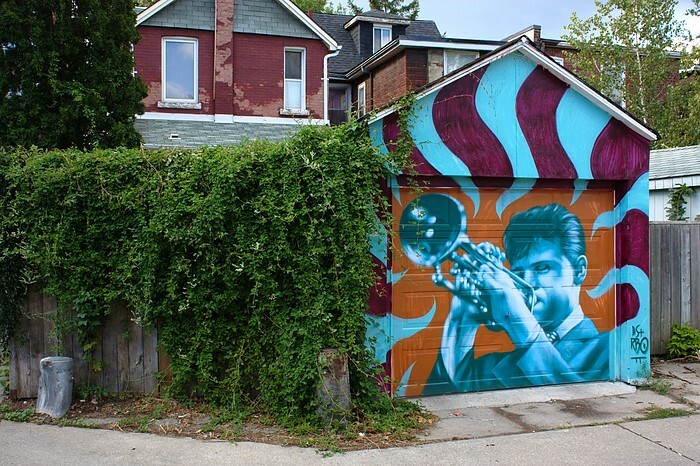 We spotted this mural on someone's garage in a laneway. Sunday afternoon, September 12, 2010. By this time, the chimney was the only structure left standing on the Tower Automotive property, aside from the tower itself. A couple of weeks before, I took this photo from inside the boiler house that surrounded the chimney. More photos from September 12th are here. 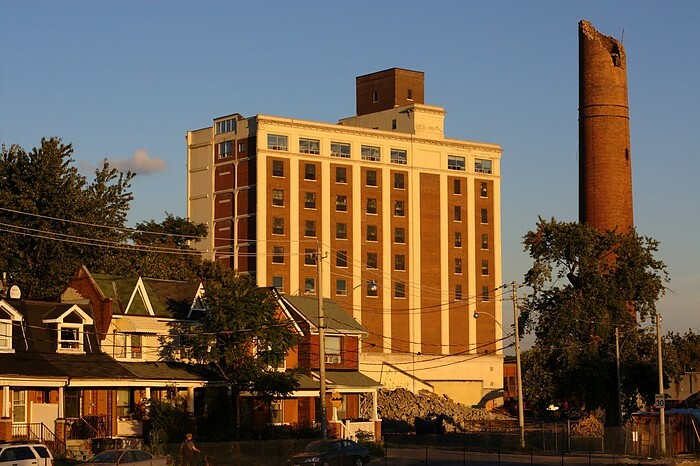 September 3, 2010: Another photo documenting the changes in the Junction Triangle as Tower Automotive gets demolished. 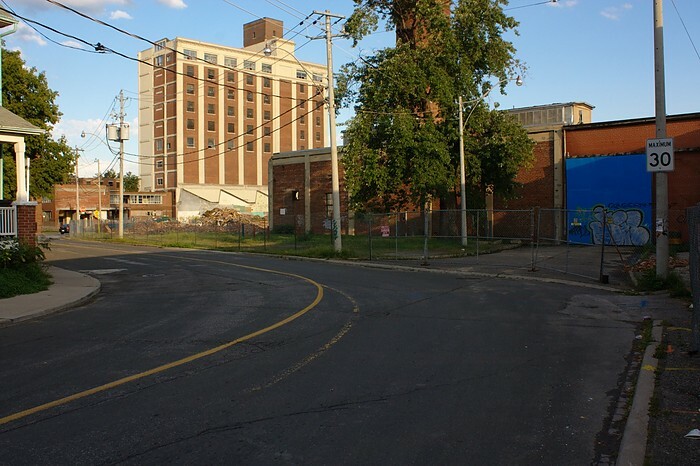 This is the view south/east down Perth Ave. By this time, most of the facade along Perth/Sterling had been demolished, but parts of the boiler house and the entire chimney were still standing. Now it's just a field of rubble. More pics from September 3 are here.